Capsules are popularly prescribed by doctors for treating various conditions amongst the pediatric and geriatric patients. The increasing consumption of capsules is attributable to their ease of administration. The demand for capsules is also expected to be on the rise as the drugs do not disintegrate due to gastric acids and thus enter the small intestine, where they dissolve to perform the desired action. All of these factors are expected to propel the growth of the global capsule filler market, which offers a special type of equipment to manufacture capsules. Against this backdrop, the global capsule filler market is expected to reach a valuation of US$845.1 mn by the end of 2024 as against US$557.2 mn in 2015. Between the forecast years of 2016 and 2024, the global market is projected to expand at a CAGR of 4.9%. The growing awareness about leading a healthy lifestyle and ensuring intake of proper nutrition has augmented the demand for nutraceuticals in recent years. As these health supplements sold in the form of capsules, their consumption has had a positive impact on the growing market of capsule filler. Analysts predict that the demand for capsule fillers will continue to be high during the forecast period due to stringent regulations set by various governments to ensure certain standard while filling capsules. Thus, the demand for precision, efficiency, hygiene, and speed have boosted the growth of the overall market. On the basis of equipment, the global market is segmented into manual capsule filling equipment, semi-automatic capsule filling equipment, and automatic capsule filling equipment. Of these, the automatic capsule filling equipment segment dominated the global market in 2015. The segment is estimated to retain its stance in the coming years due to the growing need for automation in production processes. Furthermore, automation also eases the process of large-scale production, which has also provided this segment a significant boost. On the basis of material, the global capsule filler market is divided into powder capsule filling equipment, liquid capsule filling equipment, granules capsule filling equipment, and tablet capsule filling equipment. Of these, the powder capsule filling equipment held the largest share in the overall market in 2015. The segment is estimated to continue its dominance as the majority of the medicines are best administered with powder in capsules form. In terms of geography, the global capsule filling equipment market is categorized into North America, Europe, Asia Pacific, the Middle East and Africa, and Latin America. In 2015, North America emerged as the leading geographical segment. This region showed steady growth in the demand for capsule filling equipment due to high consumption of capsules across the region. All throughout the forecast period, the region is expected to retain its dominance as the prescription of capsules continues to be on the upside due to the high prevalence of pulmonary diseases. The key operating players in the global capsule filler market are Qualicaps Inc., Bosch Packaging Technology, and Glenvale Packaging among others. The leading players held a share of over 90% in the overall market in 2015, making the competitive landscape fairly consolidated. These companies are expected to focus on research and development of innovative products in the coming years. The report covers the comprehensive analysis of the global capsule filling equipment market. The report also forecasts the market growth for the period 2016 to 2024. The report includes the in-depth analysis of various market segments based on equipment type, filling material type and in depth study of Capsule Filling equipment market across different geographical segments. The report also includes the detailed analysis of severity of various factors driving the market along with the major challenges faced by the market. Various sections of the report give the snapshot of the market along with the porter’s five force analysis and value chain analysis for capsule filling equipment market. Capsule filling equipment is used for filling various types of dosage forms into a capsule with precision as any kind of defect in a capsule will impact the incorrect amount of medicine administration to the patient which impacts safety of the patients. Also contamination due to leakage of the medicine is avoided by using capsule visual inspection equipment and branding of drugs to differentiate them from their generic counterparts is done by imprinting logo or mark on capsules. On the basis of equipment type, the capsule filling equipment market is segmented into manual capsule filling equipment, semi-automatic capsule filling equipment, and automatic capsule filling equipment. Automatic capsule filling equipment accounts for the largest segment, by revenue, in 2015 and is expected to remain the largest segment in 2024. The market revenue and forecast for different capsule filling equipment based on equipment types have been provided for the period 2016 to 2024 in terms of USD million, along with the CAGR for the forecast period from 2016 to 2024. Filling material type segmentation covered in this report includes powder capsule filling equipment, liquid capsule filling equipment, granules capsule filling equipment, and tablet capsule filling equipment. Powder capsule filling equipment segment accounts for the largest segment, by revenue, in 2015 and is expected to remain the largest segment in 2024 also. The section in the report provides the historical revenue sales for 2015, along with the forecast for the period 2016 to 2024. 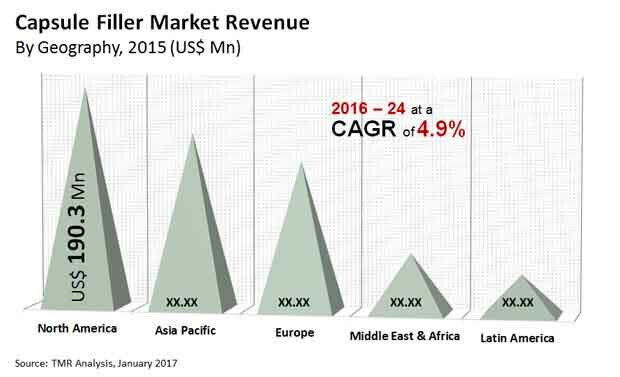 Each of these segments provides market size and forecast for the period 2015 - 2024, highlighting the key, influencing and challenging factors for each segment. The report also includes competitor analysis of key players in the market, their market share, various business and marketing strategies adopted by them, along with recent developments which helps in strategic decision making. The report provides information on raw material suppliers, and OEMs which are included in the value chain analysis. The report provides insight into market dynamics, industry competition, and the most profitable segments in the Capsule Filling Equipment market using the porter’s 5 force analysis and market attractiveness analysis. The report also provides existing trends and their impact on the market growth by assessment of various factors and opportunities for the market. Overall, taking into consideration the various factors affecting the Capsule Filler market, the report includes a holistic analysis of the global Capsule Filler market, and provides an estimate of growth for the forecast period 2016 to 2024. Some of the leading players in the market are Qualicaps Inc. (Japan), Bosch Packaging Technology (Germany), Glenvale Packaging (U.K.) among others.